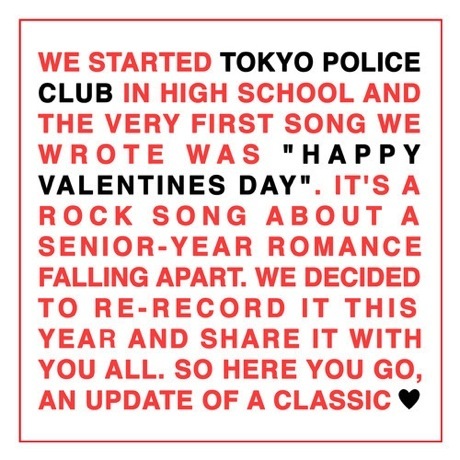 Tokyo Police Club "Happy Valentine's Day"
While Tokyo Police Club are gearing up to release a new album, they've dug into the archives and recorded a new version of their first-ever song. Appropriately, given that it's February 14, the song is called "Happy Valentine's Day." The explanatory artwork that accompanies the track (above) reveals that it is "a rock song about a senior-year romance falling apart." After a stripped-down intro, the song turns into a spiky post-punk number that isn't too huge a departure from the sounds we've gotten used to from Tokyo Police Club in the years since they wrote the track. Their album Forcefield is due out in March 25 through Dine Alone Records.